Tori Spelling pregnant with child number four! That was fast, eh? 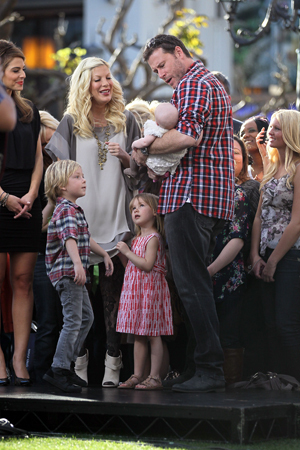 Tori Spelling gave birth to her daughter only in October. Now, the actress and husband Dean McDermott are expecting yet another child! Babies, babies, babiiiiiiies. It’s baby mania, everybody! So, here is le scoop: Tori Spelling and husband Dean McDermott are expecting their fourth child. Holy mackerel! That is one impressively substantial brood. The couple have been married since 2006 and are parents to little Hattie who was born just this past October, five-year-old Liam and three-year-old Stella. “Dean, Liam, Stella, Hattie, and I are beyond thrilled to announce that another little McDermott is on the way! We feel truly blessed that another angel has found us,” read the statement on Spelling’s website. It has been less than six months since the actress-turned-reality-star’s last childbirth and she is ready to put on that helmet and go into labour once more… Now, that is one strong woman! Congrats to the couple! We can only hope to see a children’s clothing line emerging from this experience, they already have their models.